This gorgeous luxury home is the perfect destination for your next North Shore vacation. Always Grace is luxury at its finest and is a welcoming home from the moment you step in the door. Inside you feel like you are on a ship- with wood walls and views out of the living room window, where you can see nothing but water ahead of you- no shoreline between you and the lake, thanks to your perch atop the shore's edge. This beautiful 3-bedroom, 2.5-bathroom home is breathtaking and spacious! Two additional sleeping areas (one futon in the loft and one futon in the lower level living room), the spacious living room, kitchen, dining room, and vaulted ceilings, along with floor to ceiling windows overlooking Lake Superior, make this the perfect place for the whole family. With rooms large enough for everyone to gather, while having spaces for individual privacy and reflection. This is one of the largest homes we offer and definitely one of the most beautiful. Always Grace sits on 1.6 acres of beautifully landscaped property, right on Lake Superior’s iconic rocky shore. It boasts large windows that offer excellent views of Lake Superior and a large kitchen that allows guests to not only prepare a meal, but also sit down and enjoy it together at the beautifully hand-crafted table . In the summer months, the patio and decks offer space to enjoy a cup of morning coffee and listen to the waves splashing against the Lake Superior shoreline just a few feet away. In winter months, warmth of the home creates an indoor ambiance perfect for reading books, sipping tea, and cozying up with a warm blanket. 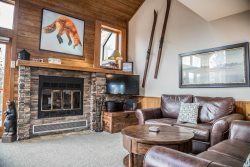 The location of this property allows guests to easily venture out for a meal or afternoon of shopping in Grand Marais (two miles away), drive up the Gunflint Trail to search for moose, mountain biking or cross-country skiing on the Pincushion Mountain Trail System (4 miles away), or hiking on the Superior Hiking Trail. Bring the whole family and enjoy! Need more space? Amazing Grace is a quaint 3-bedroom, 1-bathroom cabin that is located right next door and can accommodate an additional 6 guests. The perfect combination for larger families and small family reunions. I've rented with Cascade Properties for decades and have recommended it to everyone I know!! We loved Always Grace. It was clean and all things operational. It was perfect for our group. The kitchen is fantastic!! Also, the location was great,being so close to the Gunflint Trail and Grand Marais. The garbage containers were full when we arrived, so we would recommend better accomodation for garbage of a large group. Always has been pretty easy with cascade. Houses are set up with instructions, things are labeled. Location to GM and hikes. Lots of sleeping areas for a big group. Right on the lake (literally). Enjoyed the big kitchen and sitting around the big table. Two porches to use throughout the day with views of the lake.